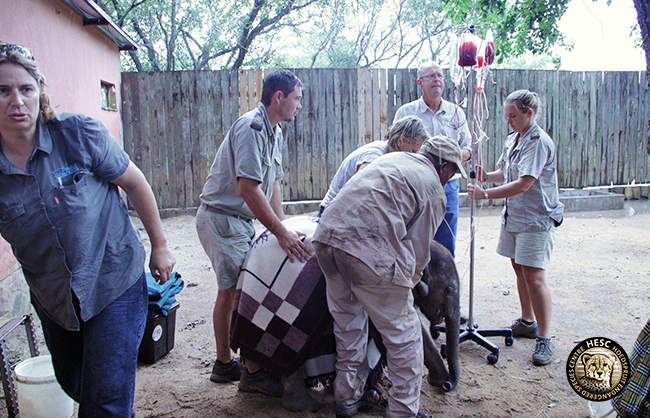 The youngest elephants in our care both recently underwent blood transfusions. Shawu is a young orphaned elephant that was brought to Hoedspruit Endangered Species Centre (HESC) last November, after he was found wandering around on his own. 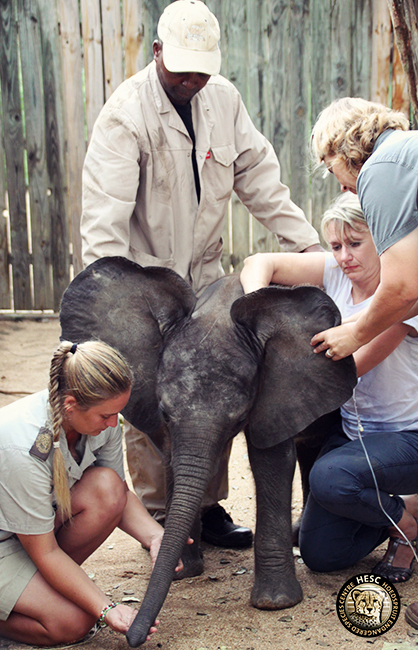 Timisa, another orphaned baby elephant, was brought to Camp Jabulani in November as well, by Elephants Alive. It has been hectic the past few months as we moved between the two properties to ensure that both these babies not only grow up healthy, but also thrive in their new environments. 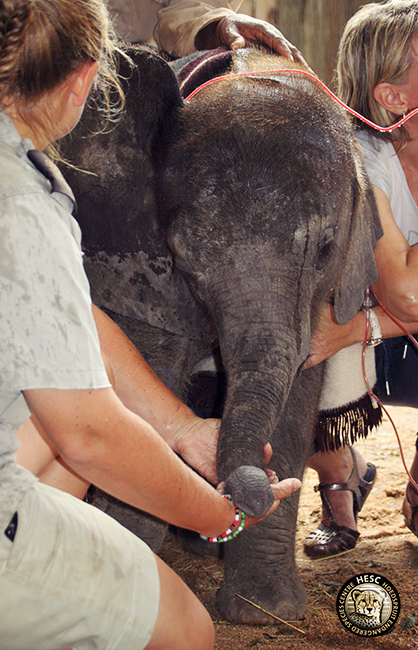 Baby elephants are quite fragile and raising them requires a lot of care and nurturing. We are, however, very privileged to have access to the knowledge and expertise of the team(s) at both HESC and Camp Jabulani. Over the weekend, Shawu had severe stomach cramps. Fortunately, we had received his recent blood results, which helped in determining what the problem could be. We discovered that Shawu’s plasma protein was low and also suspected ulcers as a possible cause of his stomach cramps – a common occurrence in elephants and rhinos. While Timisa was doing great, her blood results indicated she was slightly anaemic. Considering the fact that she wasn’t getting much milk in her diet, we were worried that she perhaps wasn’t getting enough vitamins and minerals (especially calcium), which she requires to develop her huge bone structure. Although she is being fed additional food to supplement these shortages, we have to ensure she gets everything required for healthy growth. 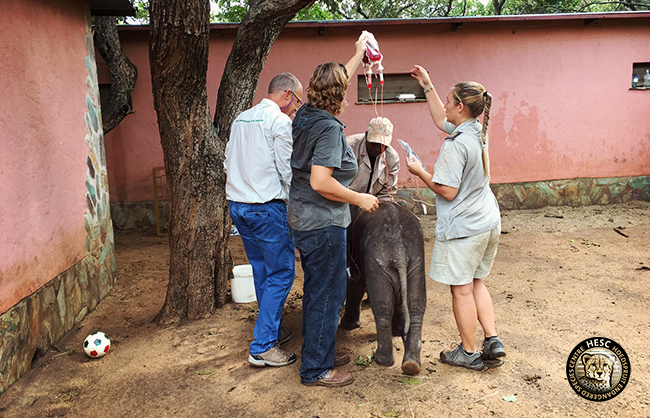 On Sunday 5th March at 2pm, Dr Rogers and his assistant, Janelle, visited Camp Jabulani to draw blood from one of the adult elephants in the resident herd. Setombe was selected as the blood donor (no specific criteria applied), and seven pints of blood were taken from her. The BAM method was used on Setombe. This process did not take long, and Setombe was back with the herd soon enough and without much stress. 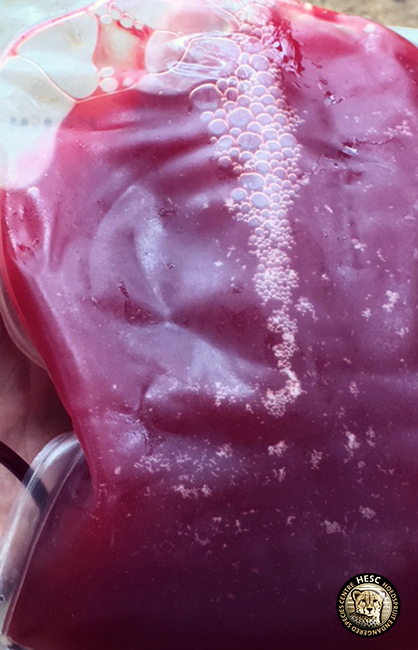 Janelle then separated the plasma and the red blood cells overnight, and these were ready to use on the two orphans the next day. On Monday at 9am Shawu was the first to undergo the procedure. He was darted with BAM, and as he was getting drowsy Stavros, his caretaker, calmed him by talking to him. The rest of the caretakers moved in to keep him steady, while Dr Rogers and Janelle were quick to get veins on both ears and to add a drip and plasma for the transfusion. Shawu received albumin, a plasma protein rich in antibodies, which will be beneficial to him. He was also treated for cramps and an ulcer, and also given minerals and vitamins, antibiotics and de-wormed. The whole process took about an hour. We look forward to seeing this little one improve and return to good health soon. Following Shawu’s treatment, we headed over to Camp Jabulani to repeat the process on Timisa. Timisa’s ‘surrogate mothers’, Tokwe and Lundi, stayed very close as we began the treatment, while the rest of the herd were feeding in close proximity. Timisa was also darted using BAM and then given red blood cells from Setombe. Other than plasma, these are thicker and it took some time before the bags were empty. The drip ‘trolley’ was even elevated in order to use gravity to our advantage. As with Shawu, Timisa also received additional calcium, vitamins and minerals, and was de-wormed. After receiving the antidote, Timisa walked straight to Tokwe and Lundi, and latched onto their breasts – first Lundi and then Tokwe. And then, the most amazing thing happened! After Timisa was done suckling, she stood between her two ‘surrogate’ mothers and gave a soft squeal. The herd, all busy nearby browsing and sipping water, left everything they were doing and came running to where the three elephants were standing. It was an unbelievable avalanche of loud trumpeting sounds as the herd gathered. Only the three bulls – Jabulani, Samopane and Sebakwe – took their time and arrived last. All the elephants stayed in a tight group around Timisa, and then went over to the tree where she was treated – sniffing and picking up the scents of vets, grooms and everyone who was around. We could see Tokwe keeping an eye on us (the humans) the whole time, which made us wonder if she knew that we were only there to help, unlike the humans who killed her mother. We’d like to think that she knew we were there to help. 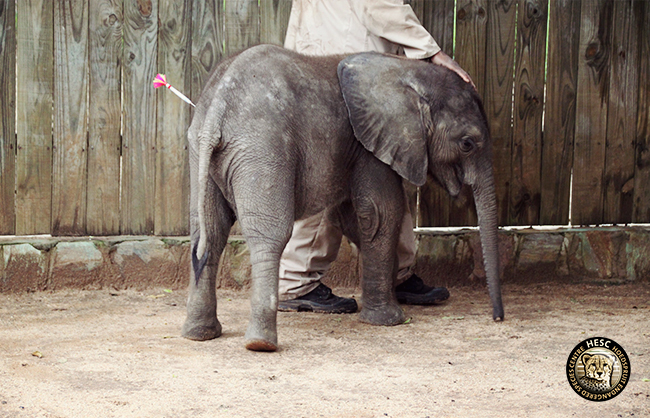 We hope and trust that the treatments will ensure our orphaned baby elephants grow stronger and healthy. Thanks to the doctor and the HESC team. We pray for the two babies Timisa and Shawu. Do elephants have blood types and Rhesus factor like humans? Thank you for your compassion. No doubt, it is understood between our species. Yes they do have different blood groups, but don’t react as negatively as humans would to receiving blood from a different blood group. What a wonderful compassionate team you are.I adore Elephants and would love to have feedback on all their progress.Thank you for what you are doing to help conservation.I appreciate your efforts as much as many others do!!! Such beautiful and special babies who deserve and receive the best of care. What a beautiful family Timisa has looking out for her! Hopefully one day soon Shawu will be big and robust enough to join the herd.